Ocotlan de Morelos, Oaxaca, Mexico, 2008. Fired clay figures painted with acrylic paints. Ocotlan de Morelos, Oaxaca, Mexico, c.1990. (7" w. x 7" d. x 8 1/2" h.). Vintage sculpture from a major collection of Mexican folk art. Some minor repairs, but generally in excellent condition. Ocotlan de Morelos, Oaxaca, Mexico, c.2000. (6" w. x 6" d. x 8 1/2" h.). Ocotlan de Morelos, Oaxaca, Mexico, c. 2000. Ocotlan de Morelos, Oaxaca, Mexico, c.2008. Josefina Aguilar is a Mexican folk artist from Ocotlán de Morelos, Oaxaca. 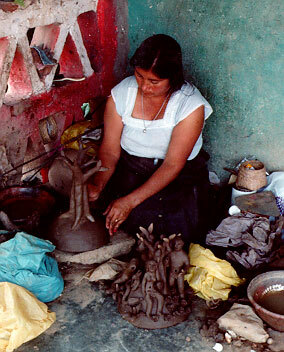 She is best known for her small clay figurines, called muñecas, an art form she learned from her mother Isaura Aguilar. Aguilar uses red clay to create depictions of everyday village activities, religious and folkloric scenes, famous figures and special Day of the Dead statues. Collectors of her work have included Nelson Rockefeller, who discovered her work on a trip to Oaxaca in 1975 as well as repeat visitors to Oaxaca, who come to see her latest work. Children's book author Jeanette Winter has written and illustrated a counting book inspired by Aguilar's life and work.